More and more wine lovers are leaning towards a minimalist, but modern charm,to their wine cellars. The appeal of a "modern chic" style to wine cellar projects has definitely come into its own. Having anticipated this, Wine Cellar Innovations developed a new racking design that is now part of its Modern Wine Cellar collection – the Glass Enclosed Acrylic Cube Series. "Acrylic racks offer spacious and elegant views, from wine rooms to living areas," said Jim Deckebach, CEO of Wine Cellar Innovations. "That's why clients will definitely love them." You can see how these two separate projects showcase just how versatile the acrylic racks are and how they can be utilized in a bevy of design concepts. The first is an actual, glass-enclosed wine cellar with an impressive 952-bottle capacity. WCI's design team took special care in the proper refrigeration and door seal to ensure the maintenance of ideal wine storage conditions. Note that the refrigeration unit is a ceiling mount system. This is certainly not an easy task. 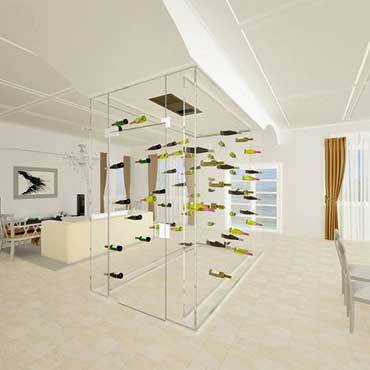 Nonetheless, WCI has over a 30 years' worth of experience in the installation of glass wine cellars. If you are looking for a high-end invisible wine cellar vibe, Wine Cellar Innovations has many options.